The mustard-y yellow hue looks great on you, and I like the splash of red and animal print from the first outfit. You know how to put fab looks together! I was into this shade of yellow last fall too! I definitely will be pulling out those pieces again this year. You look fab! Mustard yellow is great, but on me it's terrible! So I think my colurs for this Fall will be bright red and soft grey: basic but colorful! I love your blog! I just graduated college and started a new job in an office. Your style has been a big inspiration to me and my new wardrobe. One thing I'm trying to figure out is how to take care of all the new nice clothes I have. Do you hand-wash a lot of yours? Or just wash them on the delicate setting and hang them to dry? Mustard is absolutely perfect for Fall! 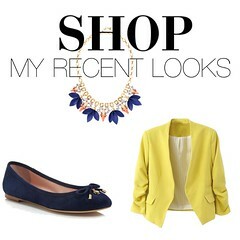 Love these looks on you! I LOVE mustard yellow and can't get enough of it, especially paired with leopard print. I adore both of these outfits! I'm obsessed with mustard as well! You look so great in mustard yellow (and every other color, honestly!) I haven't decided what my color is going to be for the season yet...maybe navy or burgundy again?